Hot stock picks represent good momentum based intra-day or short –term trading opportunities. These momentum stocks are regularly mentioned in public media like CNBC TV channel and programs, like Mr.Cramer stock picks. This publicity creates further interest in these stocks that tends to react with huge daily moves up and down. These moves are ideal opportunities for short term traders or daytraders. Such a daytrade or short-term swing trade could generate profits in a very short period of time. The momentum is always in stock that trade with huge trading volume It is possible to create a screener that looks for momentum top short-term and daytrading stock picks in FinViz, quite good financial web site. The Screener option in main menu provides four main tabs for setting a market screener. You have to set volume related parameters on Descriptive page. To find stocks that are trading with above average volume we need to set Relative Volume parameter to value “Over 1” or more. 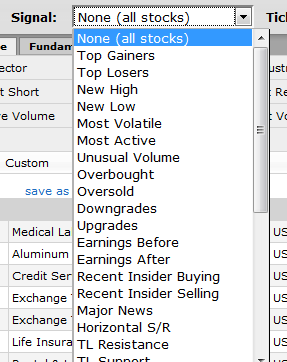 Also “Average volume” parameter should be set to “Over 300K” or more to find good tradable stocks. This free stock market screener provided by FinViz produced more than 190 picks today. These results could be exported from the site and imported into your preferred market analysis software for further analysis. Or if you think that this list of results is too big then you can try to use additional parameters to make it much shorter. The second option is to use pre-defined signals. These signals can be selected from the list on the top of the Screener page. The best pre-programmed signals are Most Active, Most Volatile and Unusual volume. These signals produce many results so it is always good to add filters like minimal average volume as described above. There is another quite nice website for stock traders that offer also stock screener. Check ChartMill and its screener as a way to find momentum hot stock picks.